General Motors and its Chevrolet brand are announcing today expansive plans to bring support for both CarPlay and Android Auto to fourteen vehicle models for the 2016 model year, a move that will mark a significant step forward for the availability of enhanced in-car smartphone experiences. The first Chevy vehicles with CarPlay support will be the Tahoe, Suburban, and Volt, all of which are scheduled to enter production in July, with the remainder of the CarPlay lineup rolling out as the new models launch in subsequent months. MacRumors attended a media event with Chevrolet marketing director Steve Majoros and GM chief infotainment officer Phil Abram yesterday where the company discussed its commitment to giving customers the flexibility to use both iPhones and Android phones responsibly while in the car and its desire to make a splash with a broad set of models that represented over half of Chevrolet's global sales in 2014. For the 2016 model year, Chevrolet will offer Android Auto and Apple CarPlay compatibility in more models than any automotive brand. 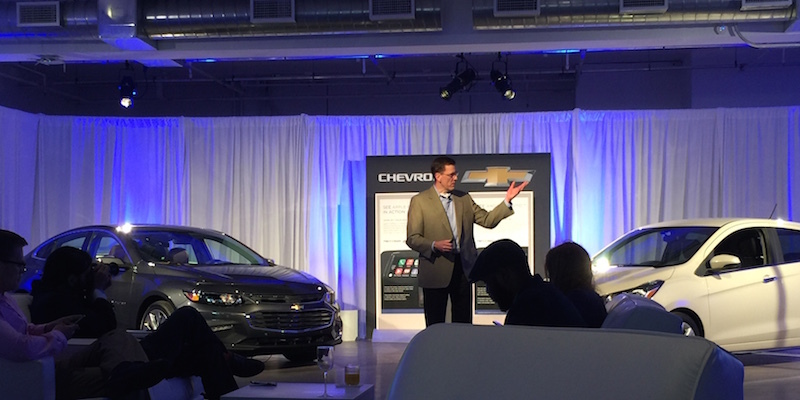 The 14 Chevrolet models include the all-new 2016 Cruze, which will debut on June 24. Cruze is Chevrolet’s best-selling passenger car, with more than 3 million sold since launch. Among the 14 models, CarPlay and Android Auto will be supported on all vehicles with 7-inch or 8-inch MyLink screens, which will include most trim lines. CarPlay support will be available as all of these new models hit the dealerships, while Android Auto support will initially be limited to those with 7-inch screens while 8-inch screen support is planned for later in the model year. Staff from Apple and Chevrolet were on hand at the event to answer questions about CarPlay integration, with Apple staff emphasizing the company's desire to make CarPlay available to as many users as possible by opening up the specification to all interested auto manufacturers. Apple also believes it is key for CarPlay to integrate with automakers' own in-dash systems rather than pushing for something like a dash-mounted iPad, giving the car companies flexibility to leverage CarPlay as they see it best fitting with their systems. Apple's representatives also highlighted the company's early focus on support for third-party audio apps due to the clear demand for such functionality in the car. The company may open up APIs for other functionalities to let additional third-party apps gain CarPlay support in the future, but Apple is being conservative considering the duty it and the automakers have toward minimizing driver distraction. With the recent addition of the Apple Watch, Apple also highlighted the way the watch and CarPlay can work together through the linked iPhone to minimize driver distractions, such as with fewer notifications being passed to the Apple Watch and less mapping information available on the wrist when the user's iPhone is in CarPlay mode. With some information already being made available through the dashboard, there is less need for it to appear on the Apple Watch. We asked Apple and GM about the potential for wireless CarPlay support, which was spotted in early betas of iOS 8.3 but not included in the final release. Chevrolet's initial CarPlay support will require the user's iPhone to be connected via a Lightning cable, but that will likely change in the years to come as future models gain Wi-Fi support for their in-dash systems. 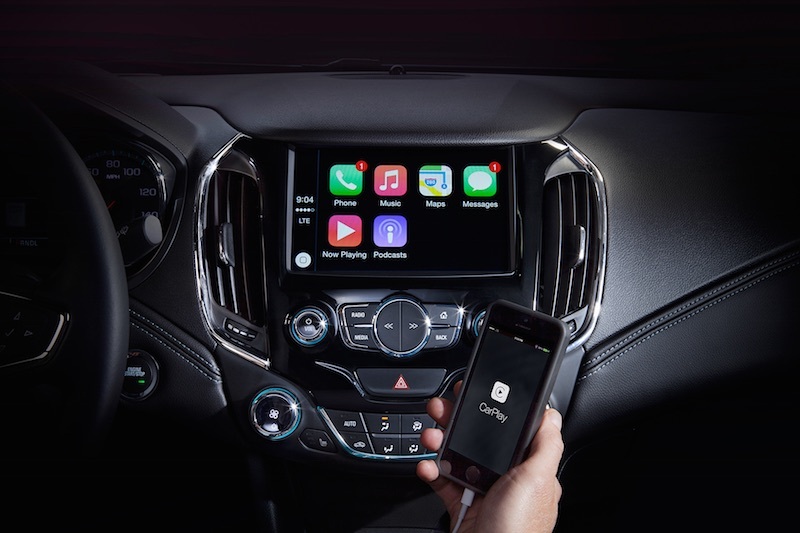 Chevrolet was one of the first brands to offer support for Siri Eyes Free mode in select vehicles and has been one of the more highly visible CarPlay partners as Apple and auto manufacturers have demoed the technology over the past year. Earlier this year, the 2016 Volt was spotted carrying CarPlay support on the floor at the North American International Auto Show in Detroit. Announced over a year ago, CarPlay has taken a fair bit of time to come to market given vehicle development cycles and other factors, although a host of car manufacturers have committed to supporting the technology. Ferrari was the first to bring CarPlay-compatible systems to market late last year, followed quickly by aftermarket solutions from Pioneer and Alpine. Apple CEO Tim Cook noted at the company's "Spring Forward" event in early March that there will be over 40 car models offering CarPlay support by the end of this year. Update: This article has been updated to correct statements regarding wireless CarPlay. Yes, now lets put carplay in cars that iphone users actually BUY! CarPlay has been available to you via third-party, aftermarket head units. they came out late last summer. You lost me at "Chevrolet". Seconded! I am not interested in buy a new car for this feature. I am however interested in putting this feature in my existing car. This will be an interesting experiment. I have read tons of studies that those with more disposable income purchase Apple while those with less purchase Android. If true, it will be interesting how this plays out in the cars. Will luxury cars tend for CarPlay? Will higher trim levels of non-luxury cars also tend towards Apple? And conversely will the cheap cars or the base models tend towards Google? The auto maker doesn't have to pick one or the other unless they have some kind of exclusive partnership. CarPlay and Auto are simply software running on the entertainment center's computer. As far as I've understood, Apple isn't making any exclusive deals with automakers, it makes no sense and would only alienate people. If they already have an iPhone, they'll want to use CarPlay. If they already have an Android phone, they'll want to use Auto. - Equinox: "Ok, accessing phone"
- Wait 10 seconds for Siri to fire up. - Me: "Ugh. Stupid Chevy"
No, because it is asinine to choose a vehicle based on if it uses Car Play/Android Auto. Manufacturers know that which is why Chevy is supporting both. Others will follow as well. My car reminds me if I left the keyless entry device in the car. It will sound an alarm when I close the door. Yes really. The tech media does not check anything. One source says it and they all repeat it. I tell you what. Find me a SINGLE source out of ALL the internet of wireless Carplay actually working. Anywhere. In fact, go through any and all documents about iOS 8.3 put out by Apple and show me even a HINT of wireless carplay being one of the features it introduced.